Days are getting shorter and temperatures are dropping, which means the holidays are creeping up on us. Having personalized holiday greeting cards, gift tags and special stickers printed is much nicer than buying generic versions from the store. If you’re thinking about designing and printing with a personalized message, the time is now, and ISS On Demand can help. The holidays are one of the best times of the year to connect with new and existing customers. Many business communications have become so impersonal. If you have a new or updated brand, personalized printing is a great opportunity to promote your new look for the new year. Make sure the design you choose is true to your business brand. Greeting cards reflect your business and your brand, and are a way to say “Thanks, we appreciate and value your business.” A greeting card shows your customers that you took the time to select something specific for them, that expresses your gratitude for your business relationship in the past year. It’s also a subtle reminder to do any necessary holiday business with you. Just a line or two to express gratitude and good wishes is enough. Keep in mind that holiday greeting cards should be sent out and received before the end of the year. Often, businesses close before and after the holiday, so receiving your greeting card before their holiday vacation begins will have the best effect. Tip: Have all your greeting cards addressed before Thanksgiving to avoid the last minute rush. Even better, if you have your contacts in your computer, print out the addresses. Personalized gift tags let the gift receiver know where the item originated from. In some ways they are like a limited edition business card that someone can hold on to for future reference. Make sure both sides of the gift tag are used to their potential. Tip: Create space on the back of the tag for a little message and to list who the gift is from and who it’s for. Personalized with your logo, stickers add a nice touch to gift bags or wrapping, if your business offers this service. Make it a memorable branding opportunity by enhancing your colors and images with some holiday flair. Stickers are an inexpensive way to add an extra touch and really complete the look of a package or envelope. They are multipurpose – you can use them as envelope seals, address labels and return address labels, depending on the size shape and what is printed on them. Tip: Be sure to use wrapping paper and ribbon in the same colors as your holiday embellished brand image and logo. If you need assistance with creating personalized greeting cards, gift tags and special stickers for your business, ISS is ready to help you design your perfect holiday message. We offer a variety of printing options for your greeting card as well as other print design services. Call ISS today to start your design. When starting a business one of the paramount necessities is your branding design and how you choose to market your business. These are big decisions because you want to pick marketing tools that are cost effective, that are professional, and represent what your company has to offer. Branding needs to be visible, original, and unavoidable. It also needs to be versatile and durable. If you want to create successful marketing tools that attract attention to your business, then large format printing such as well crafted posters and signage are both excellent strategies. Large printing has the power to make your customers and prospects notice what you have to say, and therefore want to interact with your business. Posters and signage are versatile. They can be seen anywhere at any time, and seen by anyone. Use them to announce promotions or provide info about your company. Both are extremely cost effective when compared to the cost of print, radio or tv. With today’s advanced printing technology, we can create high quality, visually dynamic material on a large scale, and have people talking about your business and what you have to offer. Posters and signs are great to use locally, where people drive in the same patterns daily. They will constantly see and remember your logo, your colors and your message if presented in a unique and engaging way. For walkers and shoppers, bright, noticeable signage at eye level will have the same effect. Communicate your message instantly at first sight. Less is more when it comes to posters and signage, so choose catchy key words, use your brand colors and a large image of your logo. If space allows, have a call to action like an invitation to visit your website, give your store location, or an opportunity to redeem an offer. Choose wisely, because if your imagery is too busy, viewers will not be able to take it all in. Longevity – these items can be for short term or long term use, and used indoors or outdoors. Posters can be laminated, framed and/or mounted for better durability. Signs can be used outdoors as landmarks and indoors to promote and locate merchandise. Designing posters and signs requires many decisions. We are here to help you design the right message for your business? Contact ISS today! Retractable banners are an easy and affordable way to showcase your business brand in a variety of environments. Like windows for your marketing, retractable banners can easily be open and closed, transported and repositioned with ease, and are space efficient when either open or rolled up. Their professional image attracts attention and increases foot traffic to where you display your banner. 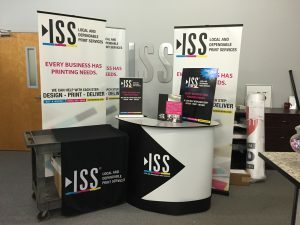 Banners from ISS have aluminum frames and anti-curl vinyl banners. Aluminum is a sturdy but lightweight metal, and anti-curl vinyl is durable and easy to maintain – you can use it outdoors, it resists fading, and is easy to clean. Retractable banners are also great for use in banks, as office decor and in restaurants, and any other location where you want to draw attention to your company brand. Protection – the printing on your banner is covered when rolled up and kept in its storage tote. You can choose from soft, padded or hard carry cases. Where will you be using your banner? This will effect the size of the banner you choose. What size base will be best for you? For indoor banners a basic base with foldable legs might be sufficient. But if your banner is large or you’re planning on using it outdoors, you will want a bigger and more stable base. Should you choose a bungee or telescopic pole? Bungee cords are static and have no flexibility in height. Telescopic poles can be adjusted to increase or decrease your graphic by 20″ to 30″ in height, which is a great benefit if you have a few different size banners. Which type of clamp bar do you want? A grip clamp bar will simply hold the top of your banner. You slide the vinyl in to the grip then tighten it. The velcro clamp bar is similar, except velcro secures the banner instead of a grip. Both give you the option to change out the graphics, but you will need additional velcro for new banners. 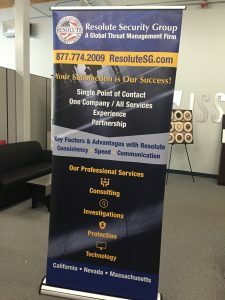 At ISS, we can assist you in designing the right banner for you. Call us today for a banner design consultation. Trade Show Graphics: Are You Ready? You’ve reserved your space, marketed and advertised, and polished your pitch for your potential visitors. But are your trade show graphics as ready as you are? Hand samples out to familiarize the public with your product? Try to sign up new clients at a designated meeting space in your booth area? Inform everyone about new and exciting things you have to offer, and hand out promotional materials and/or give demos? Your graphics need to be bold and legible, with good quality images with high resolution. Focus on the eye catching, dynamic use of image, color, and word choice. Your company name does not need to be the star of the graphics, especially if you’re just getting started. Communicate what makes you unique, what you do differently than your competition.Your goal should not only be to engage your target customers, but to save you from spending time with customers who are not in your target market. 100 feet away or further: Use bold images to identify your brand at the maximum height allowed, visible from any spot on the showroom floor. This will get people walking in your direction. Think towers, canopies, hanging signs. 10-50 feet from the end of an aisle, or one aisle over: Choose images like your logo and tag line, that represent your company and what you offer. The best height for these graphics is 5 – 8 feet high, or just above eye level. Think outer walls, the back wall, etc. 1 – 10 feet away: Short-range trade show graphics are meant to communicate your brand’s message once attendees are in or near your exhibit space. They can include images, products, services and/or company information as well as infographics, charts and graphs that are legible from close distances. Short-range graphics are smaller than mid and long-range graphics and are meant to be read at eye level, between 5-6 feet from the ground. No matter how many surfaces or levels you have in your display what’s on them needs to tell a consistent and engaging story. There are a number of elements to consider when designing the right trade show graphics for your company. Hiring someone who has experience and skill with trade show graphics will ensure your trade show success. Contact us at ISS to schedule a consult for your trade show graphics. Rack cards are an affordable and effective marketing tool easily seen and accessed in areas of high foot traffic. The benefits of rack cards are numerous. They enable you to reach a new audience, and in some cases be seen again and again by repeat visitors to the display location. They are easy to pick up and carry, and less expensive than information filled brochures, which have 6 sides to design. You can use them to promote something specific, or as a general introduction to your business. They generally come in two sizes, 4” x 9” or 3.5” x 8.5” and the key to a successful rack card is simplicity and focus. It’s easy to try and cram information in to a smaller document like this. But it’s a high impact tool that should communicate just a few key things. Go out and look at rack card displays. What colors do you see? Which ones stand out, and why? At first glance you’ll notice that you only see the top half of the card, which needs a bright visual image that catches the eye of the viewer. Use original images that compliment to your brand. A strong headline or your business tagline in a striking font is a great attention grabber. It’s best to have them printed on a heavier card stock, with a matte finish so your bold graphics will not be effected by the glare from sun, windows or indoor lighting. Use short descriptions and bullet points. Don’t be afraid to have some white space – it creates contrast with your visual aspects of the card. Make sure you include all your contact information – business name, address, phone, website, and social media platforms. And have a call to action – coupon, online discount code, business card, etc. You can even have a 2” perforated section at the bottom for this purpose for people to tear off and use, share, or hold on to. Although the information should be clear and concise, your rack cards can be multi-purpose. They can fold, similar to a brochure, and have a menu or a listing of services, or a location map inside. One thing to avoid is listing actual prices, so you don’t have to reprint your cards every time your prices change. The more unique your rack card is visually, the more it will stand out. Having your rack cards in a variety of display locations is a good strategy. They are the right size for 10” envelopes so another versatile option is to use them as mailers. A rack card is a tangible piece of information that, designed successfully, potential customers will want to hold on to. Having an engaging and persuasive marketing tool like a rack card will put you a step ahead of your competitors. Contact ISS On Demand today to start the design for your rack card. Are you looking for a new way to draw attention to your business or a fresh way to communicate your message? Would you like to visually strengthen your identity and branding, or add some personality to an otherwise bland space? A wall mural can do all of this and more. Maybe it’s time to decorate your office or home walls with something creative and innovative. Murals are an eye catching and creative way to draw attention to your goods and services. They are wonderful visuals for hotels, restaurants, and offices, and they enhance areas of high foot traffic like lobbies and reception areas. Wall murals can add depth and dimension to a small space, and framed or unframed, they are a dynamic solution for transforming different areas. Use them to draw attention to a space, or provide privacy. With wall murals you can add depth and dimension by intensifying or highlighting certain colors, and color affects many things. It affects our emotions, and those emotions affect our spending decisions. Color also affects moods and behaviors like positivity, productivity and problem solving, great feelings to instill in both your employees and clients. You can create your mural from an original image, an existing piece of art, a photograph, or even an entire website page. The mural can incorporate your logo, tagline and testimonials. You can present a collage of different images and text. Each wall mural is unique to your specifications. Depending on the measurements, application surface and desired longevity, you can personalize it with choice of texture, finish, material and color enhancement. Available Materials: polyester, vinyl, paper, acrylic, canvas and more. Eco-friendly materials and inks are also available, and light weight but sturdy materials as well. Wall murals are easy to install and simple to clean, providing a high result, low maintenance way to decorate your office or home, or market your business brand. Contact ISS On Demand today to discuss the design for your wall mural. A small business needs to make strategic decisions about their advertising, and there are a variety of ways to market your brand. Dollar for dollar, vehicle graphics are an effective and affordable way to expose your business to thousands of potential customers when used effectively. Graphics and lettering on your vehicle can showcase your brand identity year round, unlike other advertising options like media and print. You can choose between full auto wraps, magnetic lettering for door panels, or graphics for windows and tail gates. Vehicle graphics can be created to have changeable sections that are quick and affordable to update, so you are not locked into one static ad campaign for the duration of the wrap’s life. And vehicle wraps are long term – they can last 5 years or more, with the added value of protecting your paint job from stone chips and scratches. Whether it’s one or multiple vehicles, we will craft vehicle graphics that communicate your message. You can use the same colors from your logo and other marketing materials.We will help you design visually engaging images that are suitable for a broad range of vehicle makes and models. • Park close to the road or in the middle of the parking lot for the most exposure. Choose a spot next to an empty space or a vehicle that doesn’t block the ad on your vehicle. • Drive on the highway for a mobile billboard effect. Time in traffic is bonus exposure.